Yesterday marked two weeks since we’ve been home with both of our girls, and our home and hearts are so full! I plan to write both of our girls’ birth stories in the near future, so I can remember the details before they get murky and blur together. 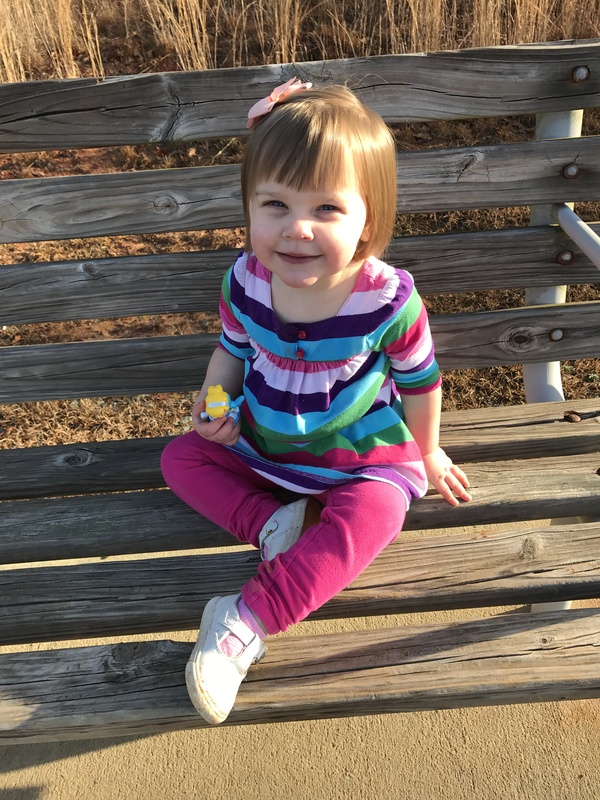 Plus, at 25 months, it’s probably about time I document Nora Beth’s somewhere, yes? Before having Annablair, I had a lot of anxiety about what life would look like with both girls here. Not really anxiety about whether I would love them both (though, in full disclosure, I did ask several friends who had their second babies right before me if they loved the second as much. I appreciated their honesty so much. ), because I knew that as obsessed as I am with Nora Beth, of course I would feel the same way about Annablair. 1. What were we going to name her? 2. 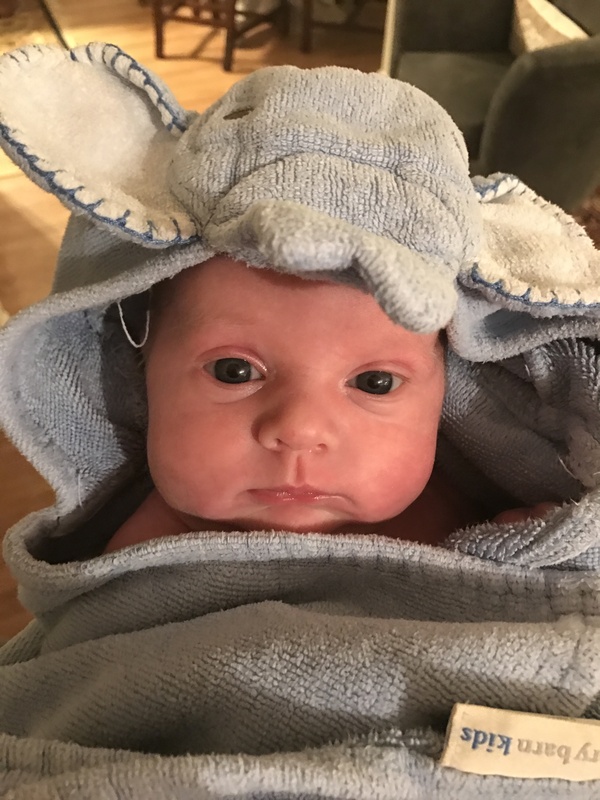 Would we have another newborn as easy as Nora Beth was? 3. Nora Beth had JUST turned 2. How would she adjust to having a little sister? She loved the idea of the baby but obviously couldn’t actually know what it meant. 4. Would I resent either child for taking time away from the other? 5. As a self-employed freelancer, what would maternity leave look like? Would I take one at all? 6. About 6 weeks before Annablair was born, David returned to Rooster’s as a sous chef. What would his schedule + two kids look like for us? Here’s what it’s looked like thus far. In a word: much better than I could have dreamed. In another word: Chaos. In another word: Beautiful. Not without its struggles, of course (hence the large glass of red I’m currently swilling – not to mention the cookies I made and inhaled earlier), but truly wonderful. 1. Spoiler alert: we named her Annablair. A name we decided on around 36 weeks pregnant. I never anticipated having so much trouble naming her, but it was a struggle this go-round. David and I settled on Nora Elizabeth, “Nora Beth,” within a week of finding out she was a girl, and we never disagreed on it. This time, we were on seemingly different planets when it came to naming our daughter. Around 20 weeks we narrowed the list to Blythe, Blair and Sutton (before we even knew she was a girl, we agreed that Emory would be part of her name). Blythe had been my favorite girl name since before we had Nora Beth, and in my heart, I’d been calling this baby Blythe Emory since we found out we were pregnant. We decided that it was her name, and we thought we were done. As the weeks passed, though, and we shared with a handful of people, something just wasn’t feeling right. Maybe it was the tepid reactions we were getting; maybe it was the name combo; whatever it was, one night as we were falling asleep, I asked David if he still loved it. I think we were both relieved when we could openly admit that it wasn’t feeling right. Unfortunately, going back to the table opened a new can of worms as we both spent waaaay too much time thinking about waaaay too many names. At some point, around 30 weeks, I lamented that we never should have thought to rename her, and we should go back to our original list. 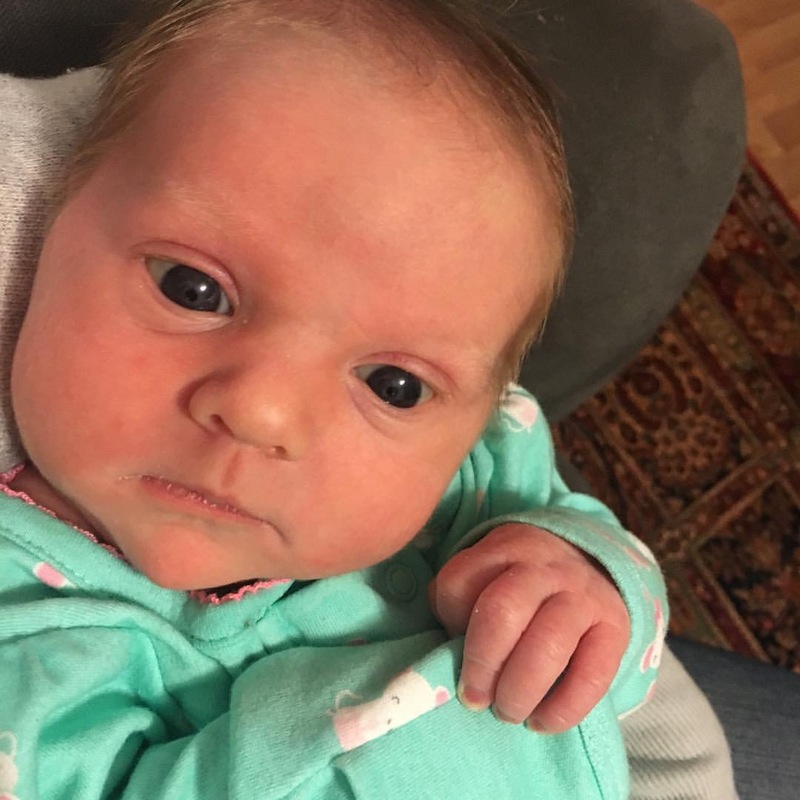 We settled on Emory Blair Arey and would call her “Blair.” It fit a lot better than Blythe did, but for some reason I couldn’t stop looking up or thinking about other options. I wanted to love it, and in theory I did, but I didn’t love it AS MUCH AS I loved Nora Beth’s name, and it still felt a little off. One Sunday night around 35 or 36 weeks, I was thinking about double name combos that would work well with Blair. I didn’t want to abandon Emory because it has so much meaning behind it, so I wasn’t sure how to make another double name work, but I wanted to try. Nora Beth is named for our sisters Anna Elizabeth (“Anna Beth”) and Mary Elizabeth (“Mimi”), and I loved the family aspect to it. Before I knew it, I was obsessing over Anna Blair. But how to spell it with Emory still in the mix? Anna Blair Emory Arey was a lot (I mean, how do you monogram that shiz? ), Anna-Blair Emory Arey was another option, but I didn’t love the hyphen. After looking at names like Annabelle and Annalise (and with some input from equally name obsessed friends), Annablair Emory Arey took form. The biggest hurdle was to crack open the name game to David again. The next morning, I mentioned I’d been thinking about her name and immediately saw him side eye me. I assured him I hadn’t gone back to the drawing board, but I presented Annablair. I was surprised but so thrilled when he loved it too. I can’t picture our little lady as anything else now. 2. Nora Beth was the easiest newborn. Girlfriend slept pretty much all the time until she was just about 6 months old (you would never, ever know that to see her now… she was just resting up for a very energetic toddlerhood, apparently.). Over and over again we were told, “Just wait till your second…” Well, well, well, wouldn’t you know, that precious little Annablair is giving her a run for her money. 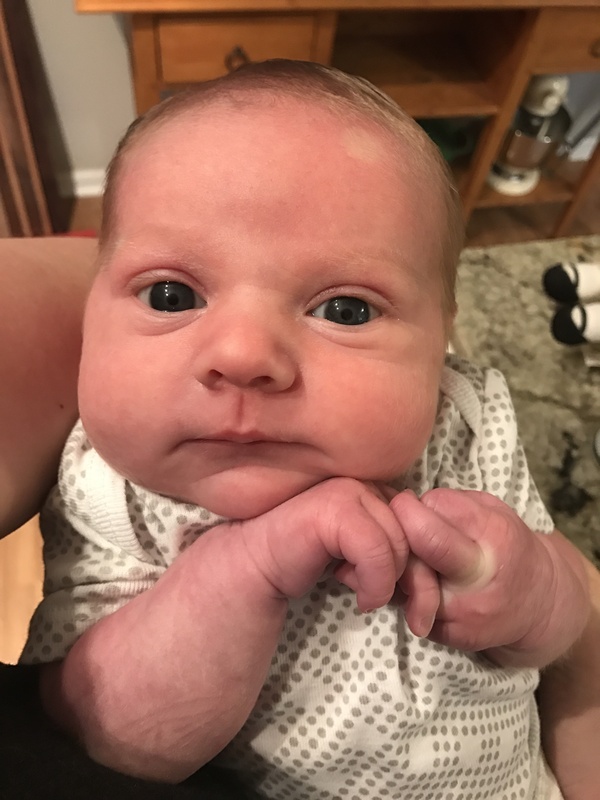 Seriously, 17 days into life, and she has made it so easy. Like her big sister, she is just a serene little soul. Happy to snuggle, snooze and eat. We really only hear her cry when she has a pesky gas bubble or is particularly hungry; otherwise she is content to just be precious and loved on. The hardest part of being her mom? Getting her to wake up enough to eat (Lord knows I wish I had the same problem). Just like with Nora Beth, I had/have an oversupply, so getting her to eat enough to make us both comfortable can be hard when all she wants to do is cuddle and nap, but we’re both figuring out a system that’s working for us, and I feel so grateful that it seems like I’m having another easy and great breastfeeding experience. 3. NorBeff turned 2 on December 18, and good gracious, our girl has personality. She talks nonstop (NONSTOP), and she’s very attached to me. She is not defiant or oppositional, but she does express her opinions and likes to be engaged in activity and conversation all day. 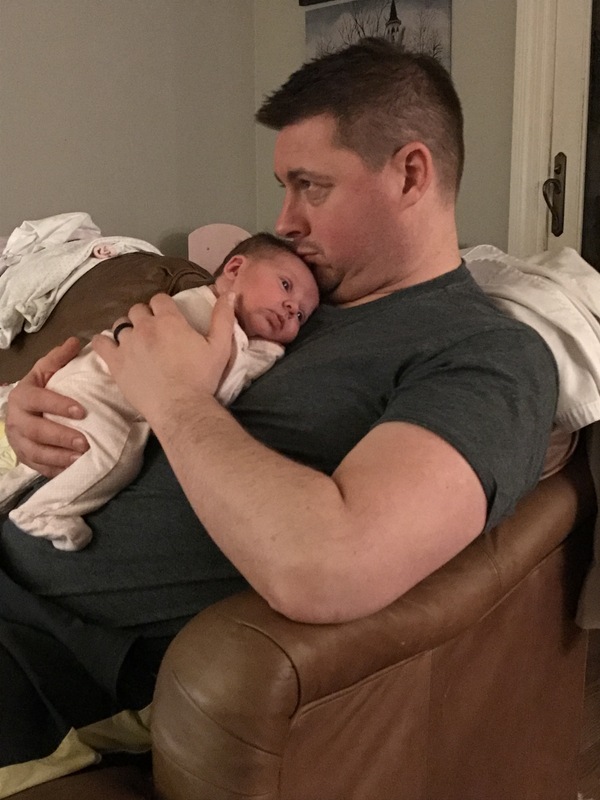 I was worried about how she would take to having Annablair with us, and I expected there to be a lot of jealousy, especially during feedings, but Nora Beth has surpassed my expectations as we’ve adjusted to a new normal. 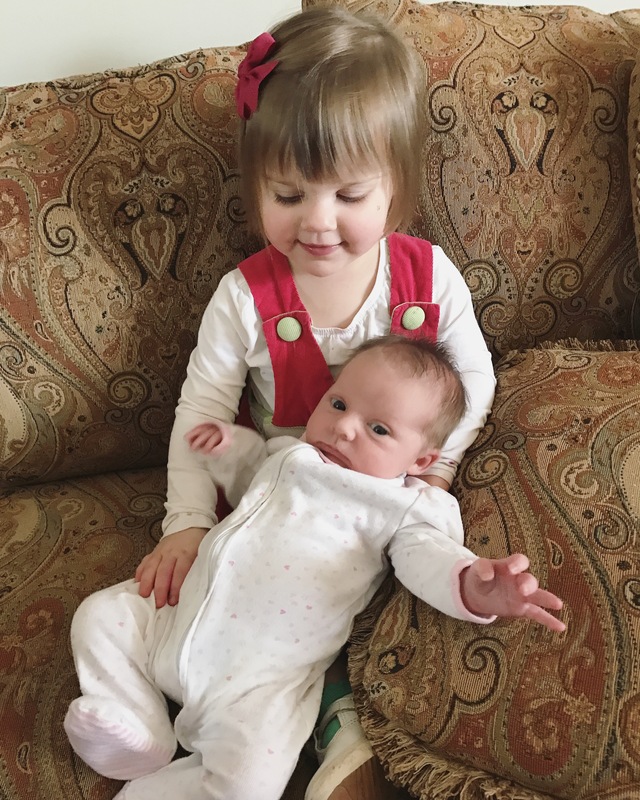 She has not shown any jealousy toward her little sister at all, and she has shown a really ideal mix of love/attentiveness and ambivalence toward her. She is very concerned with knowing where Annablair is at all times and asks me a lot if she doesn’t see me holding her. After bedtime or nap time, her first question is “See Annablair?” or “Where Annablair go?”, but once she knows, she doesn’t need or care to show her that much attention. In fact, this weekend was the first time she asked to hold Annablair, and I’m just fine with that. I don’t want to force her sister on her, plus it’s nice not to referee aggressive affection (for the moment). She does LOVE to tell me when Annablair has a dirty diaper and also really loves helping throw the dirty ones away. She’s been a great helper. 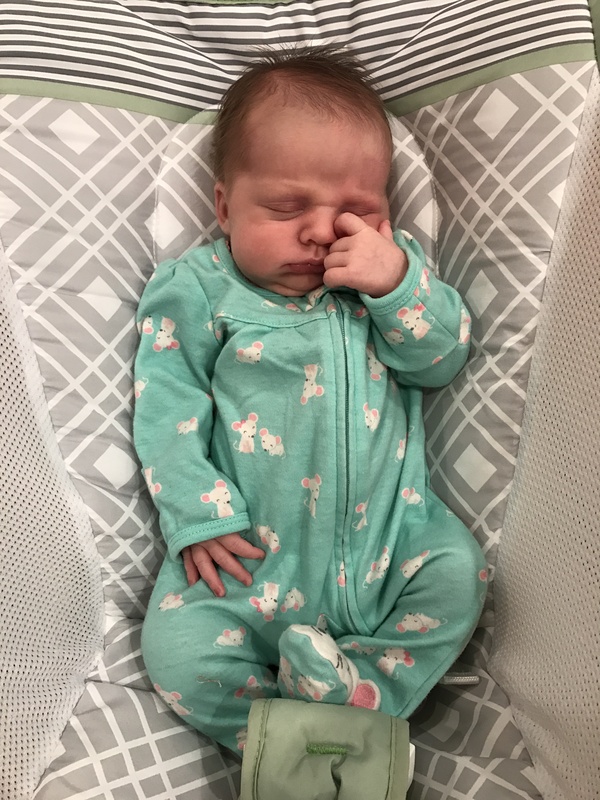 Nora Beth has been doing some boundary testing, which I feel like is totally normal for her age and for a big life transition like a new member of the family joining us. She particularly tests them when we have people over visiting or when I’m feeding Annablair. We’ve put some nice boundaries in place to help accommodate her and teach her consequences, and I’m excited to see her responding well to them! It’ll be a work in progress for the next, ohhhh… 20 years. 4. No. No. NO. I have made it a point to get alone time with each of my girls, which has helped tremendously. Last week, NB and I went to the park for a breakfast picnic date of Dunkin Donut Munchkins and to feed the ducks. It was perfect, and I think she loved it too (plus it gave Davey some special time with our newest nun!). Annablair and I are getting ample one-on-one time after NB’s 7:00 bedtime, plus I can’t get enough of our snuggles on the couch during toddler nap time. We’ve also been extremely active from nearly day 1 and intentional about keeping our normal activities the same for Nora Beth. 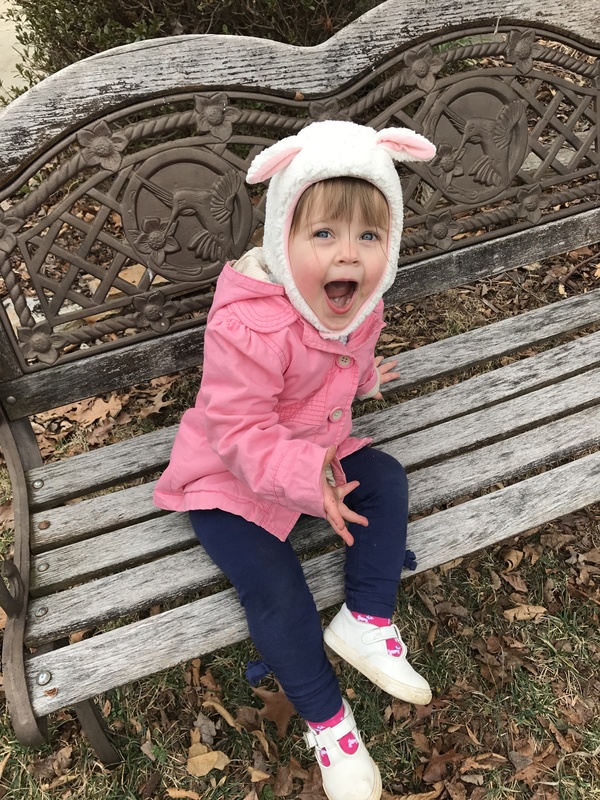 We’ve taken a family trip to Imaginon, multiple park trips, a breakfast story time visit with Madeline this weekend, visits to see Daddy at Rooster’s, lots of time at my mom’s house, and outside play. 5. I honestly had no idea what maternity leave would or should look like for me. My schedule grants me a ton of flexibility, but for our household I need to be billing hours. I also didn’t know how much I would want to do or how much I would be able to do. Turns out, I worked through labor and our time in the hospital and have been working since then, and I don’t say that begrudgingly at all. The beauty of being a copywriter and social media manager is that I can work and post with a newborn on my chest and create content while pumping or during late night feedings (though, those require extra proofreading after my first Diet Dr. Pepper of the morning. Wink.). I’ve worked a few hours every day, and it currently feels like a great balance. 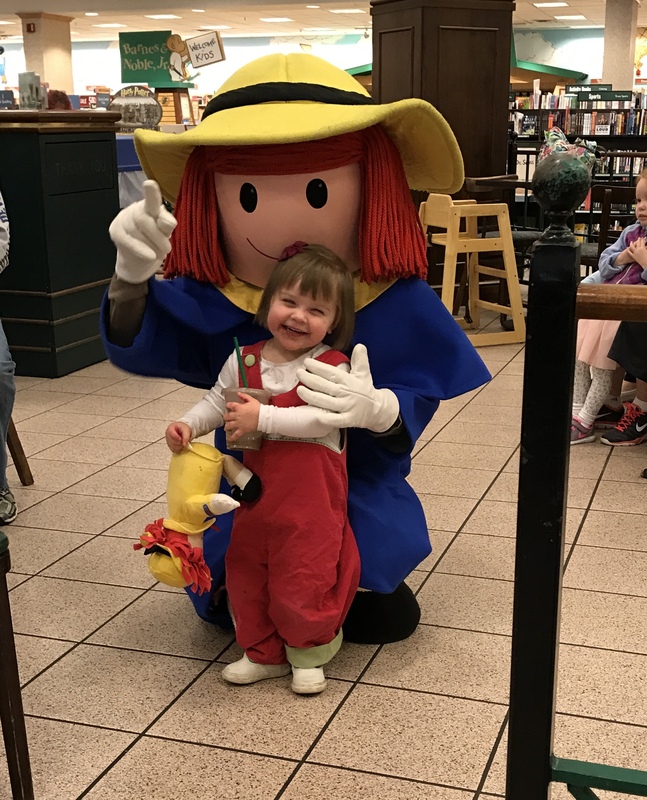 David and I decided before Annablair was born that Nora Beth would keep her same schedule with our nanny from the get-go, to give her an outlet of activity and change of scenery and to give me the same time to work that I’ve been used to. Thankfully, my clients have all been extremely accommodating of me bringing our newest lamb with me to meetings the past couple of weeks. I truly cannot believe how great I feel post-childbirth (thanks, 8 minutes of pushing! ), but I do want to stay extremely self-aware and make sure that what I’m doing now doesn’t become detrimental in a few weeks. I can sort of feel that lingering in the background, but again, for now, it’s not only manageable, but welcome. 6. David’s return to Rooster’s was a cause for celebration in our house. We sincerely adore the ownership and business of the restaurant group, and after a 2 year leave to explore other opportunities, it became clear to David and myself, that he should be back in the restaurant. As a wife, my heart has been so full watching him step back into the role with such confidence, assurance and fulfillment. The reality of restaurant life (or “chef work,” as NB calls it), is 14 hour days, typically lasting from 9 or 10 a.m. to 11:30 p.m. Annablair was born on a Thursday, we came home on a Saturday, and David was back to work on Monday. In so many ways, that has been wonderful and worked out well. He and I know how to make that schedule work between us, and I was used to making it work with 1, but there have been challenges with 2. 5 out of 7 nights a week, dinnertime, bath time and bedtime fall solely to me (David takes charge on his off-days, which is such a welcome reprieve! ), and honestly, that series of activities while juggling 2 dogs (don’t get me started), a toddler and tiny babe has felt like a lot some nights, and there have been several evenings that I’ve come downstairs near tears about how frazzled and frayed I feel. It has been the greatest gift to mother Nora Beth for 2 years without having more than a handful of nights where I felt really glad she was going to bed. There have been even fewer times that I’ve felt like I’ve lost my cool or given into frustration with her. I just sincerely ENJOY being with her. But fixing dinner and a bath, reading bedtime books, singing bedtime songs, and negotiating the preferred way to be tucked in with a toddler while nursing or soothing (or both!) a two-week old has gotten the better of me more times than I would like lately. I’ve been frustrated with myself and felt guilty for being thankful to close the bedroom door and come downstairs to quiet or Friends reruns. I never want Nora Beth to feel the frustration that I’m wrestling with and assume it’s because of her. Sure, she’s a 2 year old, so there have been nights where it has been because of her, but really it’s because I’m still hormonal, learning how to be a mom to two little tater tots and just feeling overtired come 6:00 p.m. I am beyond extremely thankful for a mother who has been SO willing to come help at a moment’s notice. She has gone above and beyond to serve us and spend time with one of the girls while I tackle the other or take Nora Beth to Trader Joe’s to let me have a nap or bring over a delivery of Flonase. Little, THANK YOU. Also, the meals we’ve received from her and from friends have been incredible and extra helpful on those nights of frayed edges. Overall, settling in is exactly what we’re doing, and I think we’re doing it well. Despite the fatigue (who isn’t exhausted these days?) I could NOT be happier to be Mommy to our bundles. They are an absolute gift to David and me, and there is no other fatigue I would rather feel than the weariness of knowing I’ve poured myself out for their benefit each day. I’m thankful for a husband who works tirelessly for us and provides for us and loves us beyond measure. I’m thankful for the ability to steward these girls for their lifetimes, and I’m thankful for the grace that’s bestowed on me when I don’t have it all together. Whew, dude. I had heard so many horror stories about going from a family of 3 to a family of 4, and not to minimize what I’ve been told (though I haven’t experienced it yet), I’m thankful that these girls have made it such a dream and a pleasure.